One of our favorite wedding invitation trends of the moment is the custom illustration. Couple Kristen and Stephen became so enamored with the quaint church at the venue where they’ll say their I Do’s that they engraved it in gold on their invitations. With the help of Allie and Carolyn of Two Hands Paperie, they created a truly personal look that allows their guests to picture the memorable scene to come and gave them a keepsake they’ll be able to treasure forever. Here, Kristen talks about sticking to your design aesthetics with so many choices and Allie and Carolyn share why it’s never too early to start the invitation ordering process. Stephen and I met through Match.com! Through the app I saw that he had viewed my profile but he didn’t send a “wink” or a message hello. I thought he was very good looking, so I sent him a “wink”. From that point forward we started emailing back and forth for the next two weeks. We finally had our first telephone call and found we had many things in common. When we had our first date July 2nd, 2012, we knew we had both found something special. Stephen and I used to live on the beach in Ft. Lauderdale. After a very romantic dinner, at the same restaurant we had our first date, Stephen asked if I wanted to go for a walk on the beach. At that moment I pretty much knew a proposal was coming. When Stephen went down on one knee I started instantly crying to the point I couldn’t see. Then I was so concerned about dropping the ring in the sand because it was dark outside that I missed him actually asking me to marry him. So, I had him ask me a second time so I could hear it. Ha! Going into the process, I knew that I wanted something classic and traditional that would stand the test of time and not be too trendy. The colors of our wedding are white, ivory and gold with a touch of blush. I wanted the paper to be ecru and have a moderate weight. I also knew I wanted gold typeface, either thermography or engraved that you could feel. By the end of the appointment I had chosen a unique envelope that I didn’t know existed and I added a seashell to the design to elude to the seaside location of our wedding. Tell me about the illustration on the top of your invitation and why you thought it was important to incorporate it. We are getting married at Sea Island, a beautiful five-star resort on the coast of Georgia. It was important for us to get married in a church, and the Chapel at Sea Island was so quaint and cute. We envisioned ourselves getting married in that chapel from the moment we first saw it. For the invitation, I wanted to personalize the design as much as possible and make it unique to us. So I hired an illustrator on elance.com to create a line drawing of the chapel from a photograph. We also ended up using the chapel illustration on the ceremony program as well. I really liked the unique edge of the main invite. I also liked the envelope, which I had never seen used before. I felt it added a “fancy” flair to the invite. The font was very classy and suitable since the wedding is semi-formal. We saved printing costs by directing our guests to our wedding website for more information and to RSVP rather than a reply card and RSVP envelope. Nothing was unexpected. It was very fun and I can’t wait to pick out announcement cards when we have a baby on the way. Before you go to make your first appointment, have a budget in mind and also an idea of what look you are trying to achieve. I had pulled some sample invitations that I liked and found on Etsy and Pinterest. There are so many choices available, it is easy to get unfocused and swayed into a different design than you originally intended. What moment are you most looking forward to on the big day? The moment I am looking forward to the most is when I am walking down the aisle with my father and seeing Stephen’s face. By the time I met with Kristen and Stephen, they had made a lot of the decisions about their invitation. One of Kristen's major priorities was to use gold lettering. 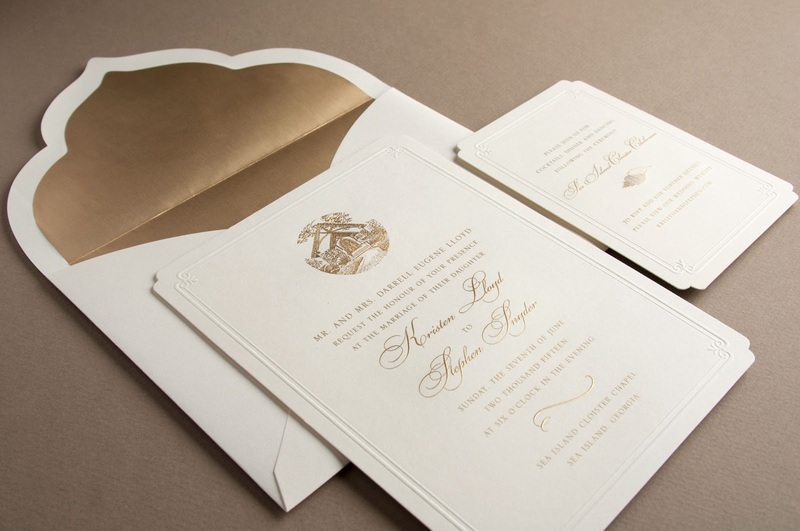 This requirement led us to look at the engraved invitation; there is little that can top the look of engraved gold! Stephen and Kristen also knew they wanted to use the illustration of the church they planned to marry in on the top of their invitation. Kristen came in with an invitation in mind, but still showed Stephen a variety of options. In the end, they chose the original invitation Kristen liked. I always ask what the bride knows she likes or wants in her invitation first. There is no right or wrong answer, but it can help me direct her toward things that fill her top priorities and save time looking at things she probably will not like. We talk about the different methods of printing and the advantages and constraints of each. Also, I ask if there is a desired budget, because that can be a major determining factor to the invitation choices. It doesn't mean the bride cannot have an invitation she will love, but it will create some parameters for the choices made. After those questions, I usually let the conversation flow naturally. Talking with a bride to understand her desired aesthetic is one of my favorite parts of the job. 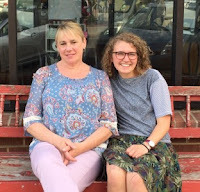 That is one of the advantages of coming into a shop instead of looking online—we have experience with the books and get to share it with the couples who come in. Plus, when in the store, the bride and groom get to actually feel the paper and see examples in person. We are all about that! Are illustrations popular these days, and when a couple wants to incorporate an illustration, how do you work with them on this to achieve the best look? Recently, we have been working with a significant number of brides using illustrations. Some of these illustrations are commissioned by professionals, gifts from friends or done by the couple themselves. Using illustrations is a fun way to further personalize the invitation, but it requires clear communication with the bride about expectations for how the final product turns out. Often this requires extra attention to the chosen printing method. In the case of Kristen and Stephen's invitation, engraving was an appropriate choice because it was a one-color line drawing. If they had desired a full color illustration, engraving would not have been a good choice. Also, it is important to have a high quality file of the illustration. Be sure to start the whole process early. It’s never too soon to start developing opinions about what you like and don’t like in an invitation. We don’t require an appointment for you to come in and peruse our books. My suggestion is to decide on the ideal date you want to put the invitations in the actual mailbox and work backward from that date. Include time for a calligrapher to address the envelopes. If you are doing it yourself, allow plenty of time. Then add a little extra time just in case things take longer than you though or happen to go awry. Consider the time it will take to produce and review a proof. All print companies count printing time required to do the printing from the day the final proof is signed. Remember that it is almost always business days, so weekends and holidays do not count. Once the job is printed, shipping time needs to be added, too. Come to your appointment with a fairly good idea of the number of invitations you will need. If you can, make sure that you and your fiancé (and often your families as well) are in agreement about the wording of the invitation. And finally, set aside plenty of time for your appointment—if you are in a hurry at the appointment, it can make what is a fun process feel really stressful. 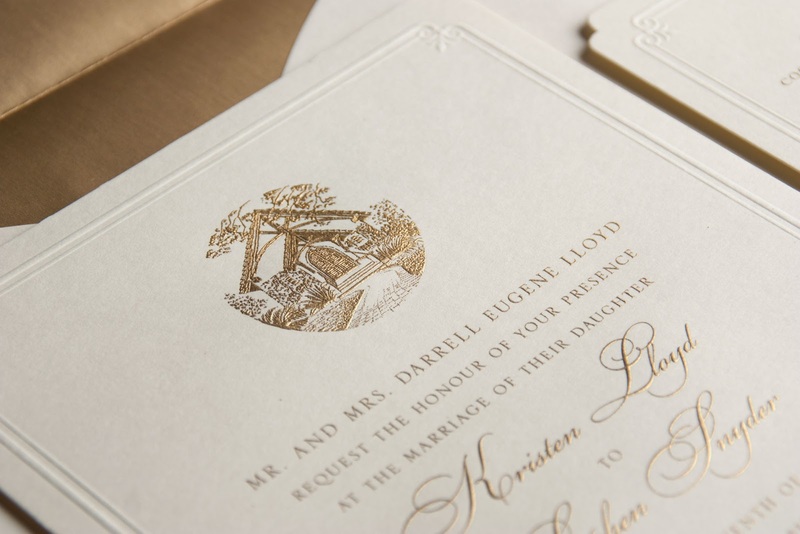 Invitation Processes is an important part to plan any wedding. Wedding Invitation Cards that are shown above are gorgeous.